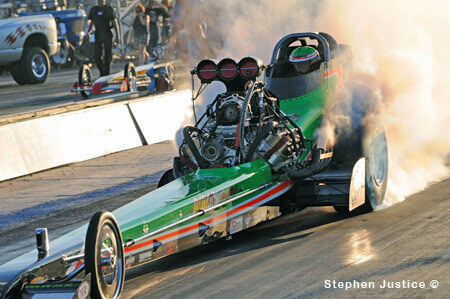 SACRAMENTO RACEWAY PARK - JUNE 7, 2008: Top fuel dragsters, long the mainstay for nostalgia drag racing on the West Coast, were the headline attraction for Sacramento Raceway's 32nd Nitro Nite of Fire. 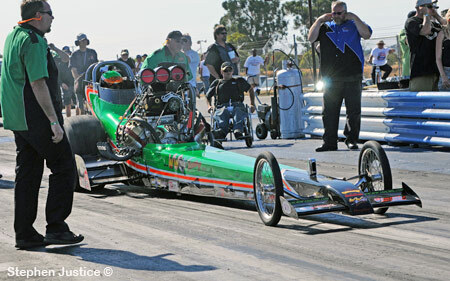 Coming on the heels of a NHRA Heritage Series race just a week before and scheduled for the same week as a hot rod reunion in Bowling Green, the event still attracted seven of California's best nostalgia top fuel dragsters for the Chicago-style elimination program. 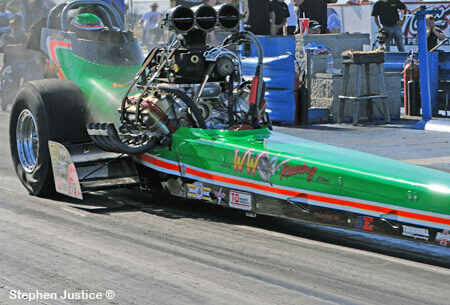 It turned out to be quite a memorable show as Jim Murphy and his WW2 Racing TFD rewrote the track e.t. record in the final round against Rick White. 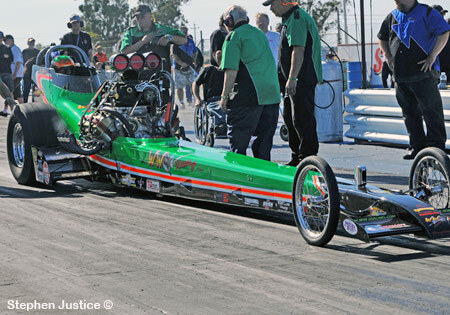 In what might have been the last appearance for the venerable '03 Stirling car, Murphy showed that the dependable and resilient piece of pipe still had what it took to pound out the big numbers. 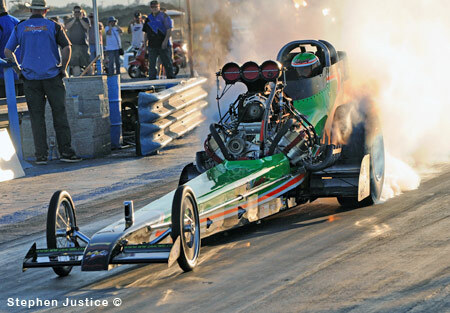 Jim has long maintained that the less-esteemed left lane was just as good as the right lane, and he proved that belief correct when he out-dueled Rick White in what was the best top fuel race in the history of the track. Though Murphy left first (.123 to .157), White pulled even by 330' and appeared to be pulling away when his '06 Hansen car made a move toward the center right as he approached the finish line. Clipping a cone, Rick was forced to get out of it, and that gave Murphy just enough time to regain the lead and record the historic 5.789-254.87 to White's 5.810-234.57. 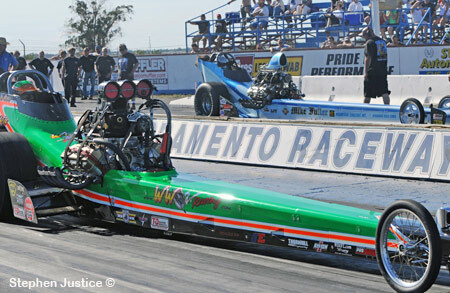 Rick White and Chuck Neal have to wonder what it will take to get a win at Sacramento Raceway? 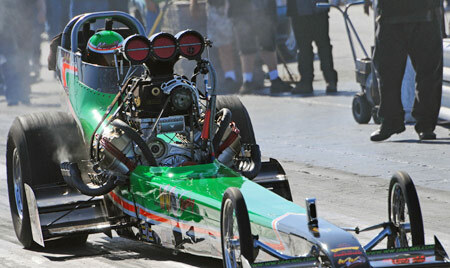 They have been to the last three finals at Sacramento Raceway, but have come up second best each time. At last year's Governor's Cup, White made five runs in the 5s (slowest was 5.91), but lost to Brad Thompson in the final with a 5.84! 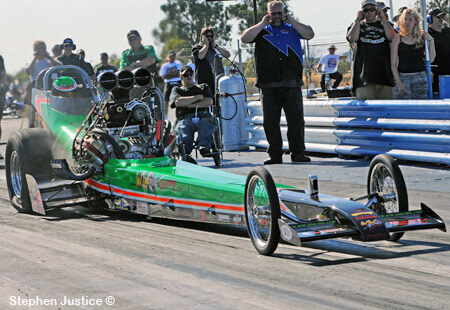 At the NNF, Rick ran three 5s, was the #1 qualifier at 5.840, set top speed of the event at 256.04, yet could not beat his old antagonist Murphy. 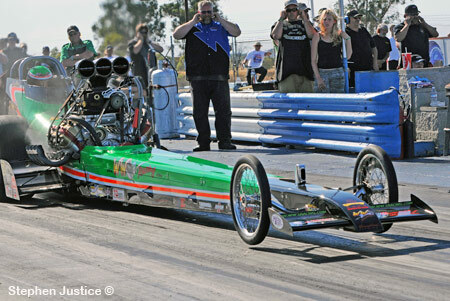 But, there is no doubt that the 2006 Goodguys champ is in top form and White-Neal will be a formidable opponent for the rest of the teams come Boise in August. As for Murphy and WW2 Racing, a new Dave Thornhill car is just about finished and ready for testing and should be ready to race at the Pepsi Nightfire Nationals come August 7th-10th. 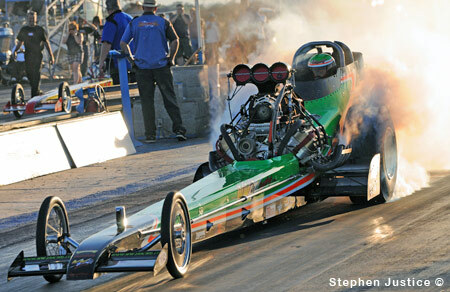 *Obviously Steve could not shoot both lanes at once so most match ups only have photos of one car but the text has the end results. For the first qualifying session Jim Murphy in his "WW2 Racing" entry was paired with Mike McLennan in the Mike Fuller Motorsports car. Murphy, running in the right lane, had a magnitude of problems including a smokeless burnout and a pass that was very un-Murphy like (which included a lot of clutch dust, too). McLennan, in the left lane, had a huge explosion at 1100', crossed over in the right lane, dodged Murphy, and then parked the still smoking Uyehara car along the K rail. 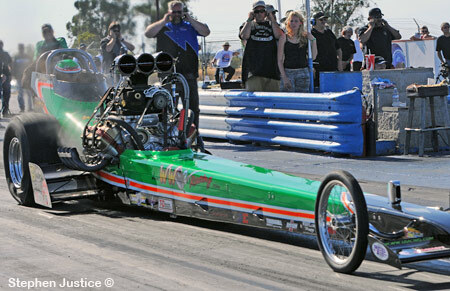 The dragster kept running for some time before Mike unbuckled and calmly got out of the car. 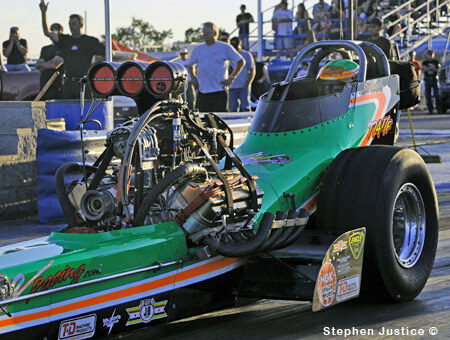 But, that run effectively ended the day for Mike Fuller Motorsports as the damage to the engine was too extensive to repair in the time remaining before Q2. For the 2nd qualifying session Murphy was back in his cherished left lane and promptly knocked Jason Richey out the final with a 5.915. 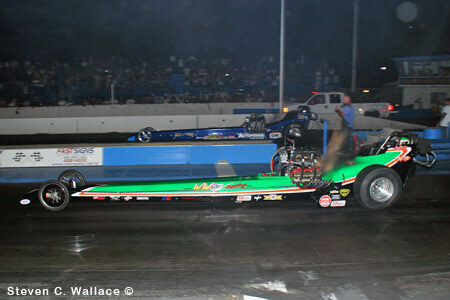 Murphy met Rick White in the Top Fuel final of Sacramento Raceways annual Nite of Fire - and won a great drag race. 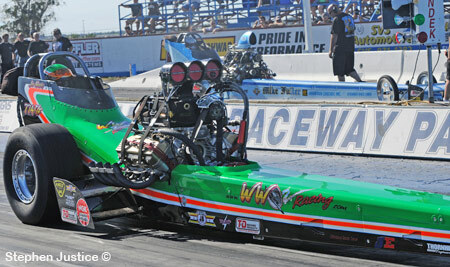 Murphy had the better reaction time and held on for the win with a 5.789 at 254.87 to a very close 5.810 at 234.57. 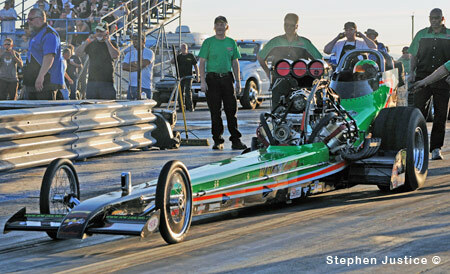 Murphy's 5.789 was a new track record and was particularly impressive as he did it in the least favored left lane. 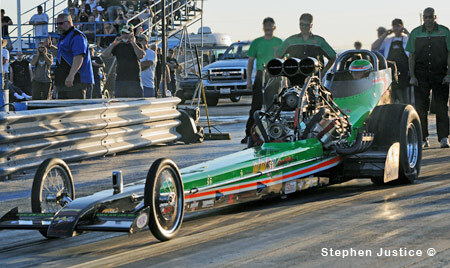 Also, his 60' time on the run (.093) was the quickest in NTF history.